Uttar Pradesh Chief Minister Mayawati ordered a ban on film director Prakash Jha's multi-starrer Aarakshan across the state. 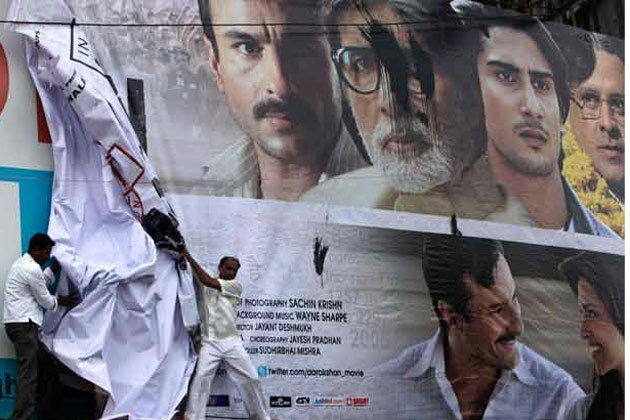 "The decision to ban the film was taken after prolonged discussion and debate on the movie after it was viewed by a high-level committee of top officials of the state", said an official press release issued late on Wednesday night in Lucknow. The release said, "After due deliberations, the high-level committee came to the conclusion that several exchange of dialogues between different characters in the film were quite provocative and could incite civil disorder and violence." Elaborating on the subject, it added, "some of the dialogues were potentially so dangerous that they could even provoke a person to commit some crime; hence in the larger interest of maintenance of law and order, peace and tranquility, the decision to ban the film." The ban will remain in effect until further orders, the order stated.